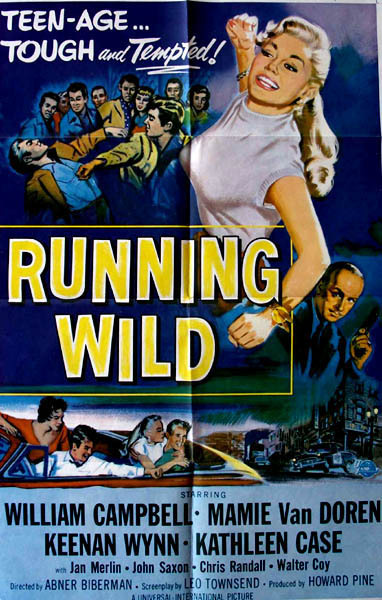 One of the earliest examples of the hot rod/juvenile delinquency flick,RUNNING WILD featuresWilliam Campbell as a rookie cop infiltrating a gang of teenagers that are stealing cars for Ken Osanger (Keenan Wynn), a nasty type who uses a gas station as a front for his nefarious purposes. Going undercover as a teenage rebel, Ralph Barclay (Campbell) not only saves pretty Leta Novak (Kathleen Case)) from being ravaged by Osanger, but wins the love of voluptuous Irma Bean (Mamie Van Doren), the former girlfriend of teenage gang leader Scotty Cluett (Jan Merlin). 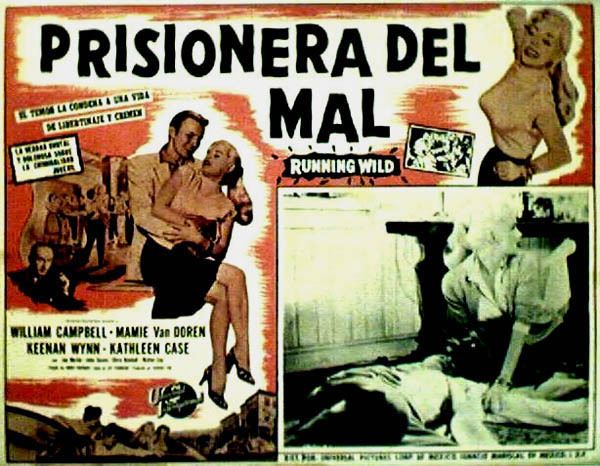 John Saxon, Walter Coy, and teen flick regular Kenny Miller also appeared in this highly exploitative crime drama directed by character actor Abner Biberman.